I have been thinking about cycling around Malta for some time. It's the smallest member state of the European Union, but is hilly enough to still present a challenge. The Subtropical-Mediterranean climate makes summer a rather unbearable time to cycle there so I've opted for a November trip instead. The weather forecast predicts 20 degrees in Malta this weekend and the temperature is unlikely to fall below the high teens all month. Three weeks ago, I stopped procrastinating and booked my flights to the island. I'll be arriving there on Saturday and returning the following Tuesday. Gareth will join me, but he needs to go home on Monday afternoon, allowing us the equivalent of two full days to get around the island - Saturday afternoon, the whole of Sunday and Monday morning. We're confident, having covered a similar distance cycling around the Isle of Wight one weekend last year. My only slight concern is that I have not ridden a bike for almost two months. My own bike is beyond repair after the aluminium frame cracked near the bottom bracket in September and I have not yet bought a new one. My only recent exercise has been a couple of short jogs over the past fortnight. Last week, I purchased a map of Malta and started to research our route. The airport is located in the south of the island and we've decided to ride clockwise from there to the capital Valletta, stopping overnight in Rabat (west of the island) and Sliema (which is only a short distance to the west of Valletta). 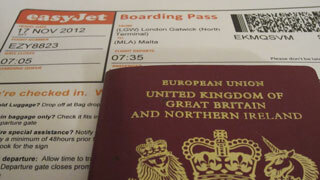 Due to time constraints, we'll skip the very eastern part of the island (between Valletta and the airport). But that's just as well, as this area is densely populated and apparently not much of a pleasure to cycle around. Worryingly, though, as I search online for general information on cycling in Malta, the terms "bad idea", "mad" and "not for the faint-hearted" keep coming up. Undeterred, Gareth and I have booked our accommodation. We'll stay at a small independent B&B called Maple Farm on Saturday night and at a large hotel (claiming to be the tallest on the island) on Sunday. I will spend Sunday night in the capital, Valletta, at another hotel. Prices in Malta are very reasonable; we're paying an average of €30 per bed each night.